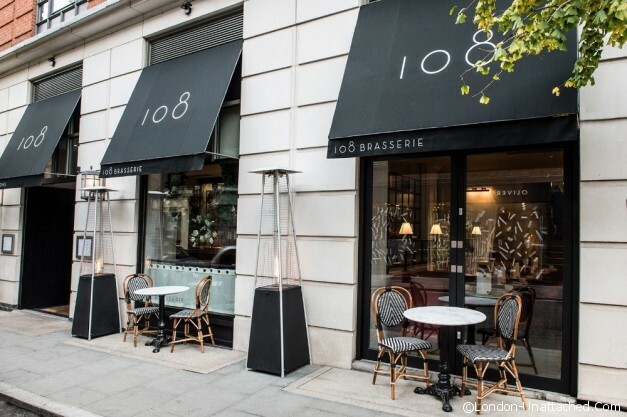 108 Brasserie is restaurant for the Marylebone Hotel right in the heart of an area of central London that almost seems to deserve the title ‘Marylebone Village’. Like most hotel restaurants it is open to all, both hotel residents and guests, from breakfast through to supper. The restaurant has taken pride in providing quality British, seasonal dishes wherever humanly possible, and to make an experience of that idea they have created a individual dining experience called Table 9, The Chef’s Table. Executive chef Russell Ford has created a 6 course tasting menu, with matched wine pairings taking you through a complete meal, with the menu changing as the seasonal supplies change. 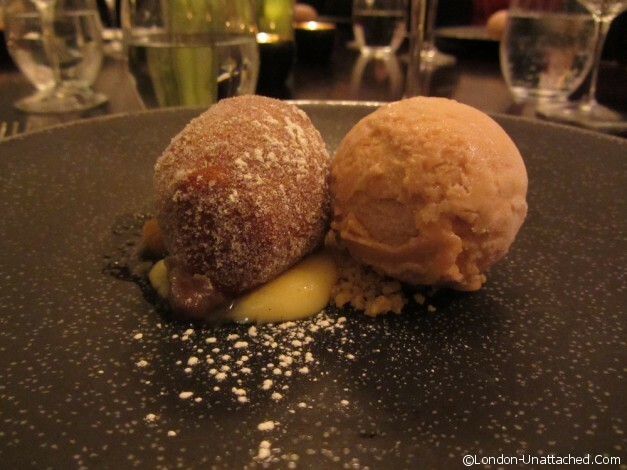 Seasonal and local are terms that are getting more popular in London cuisine, and that’s no bad thing at all! Britain has a wealth of quality produce to offer, and this clearly shows itself in the final dish. I don’t want my lamb stuck on a ship from New Zealand, I want it gambolling around Wales or The Peak district or somewhere in the UK before I eat it! We were warmly greeted by the staff upon arrival, and offered a glass of Nyetimber English sparkling wine. Nyetimber easily rivals many French Champagnes, and a recent visit to the English wine centre shows that we have the ability, if not currently the volumes, to produce some excellent wines in this country. Table 9 itself is a large round table that will seat 6-8 people, and is set in one corner of the restaurant overlooking the rest of the room. Each course was brought to the table in turn by the waiting staff, and accompanied by Chef Russell Ford who gave an explanation of the sourcing of the ingredients, where they were from and how they had been cooked. 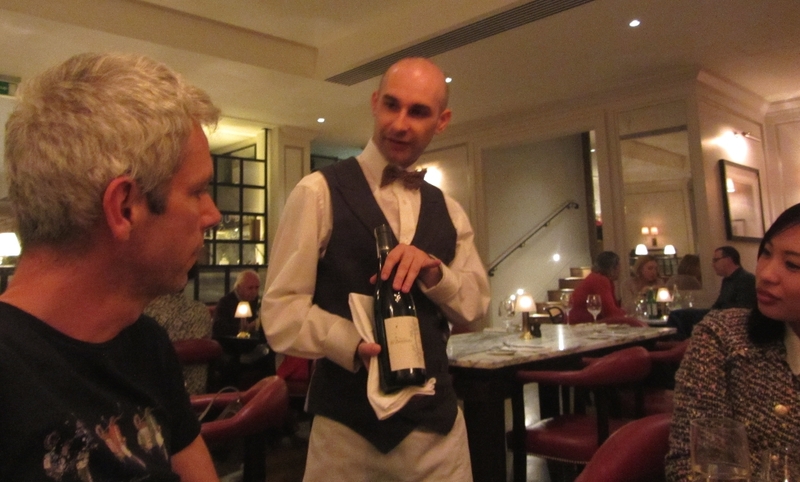 Then the wine waiter presenting the matching wine for that course and gave a brief explanation of its qualities. Our first course was a first ever tasting for myself. 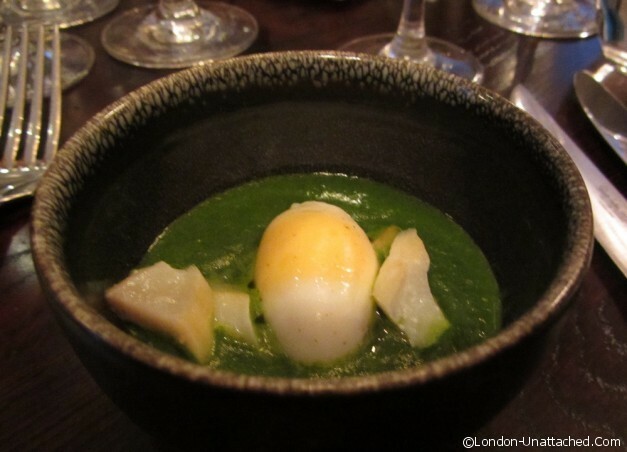 Watercress soup with a Poached Black Headed Gull’s egg, and smoked Haddock. Gull’s eggs have a very short season, a mere three weeks, and often are collected by precarious methods by licensed pickers who dangle over cliffs in climbing gear! I thought it quite delicious! The egg was perfectly cooked, and the flavours complimented each other superbly. 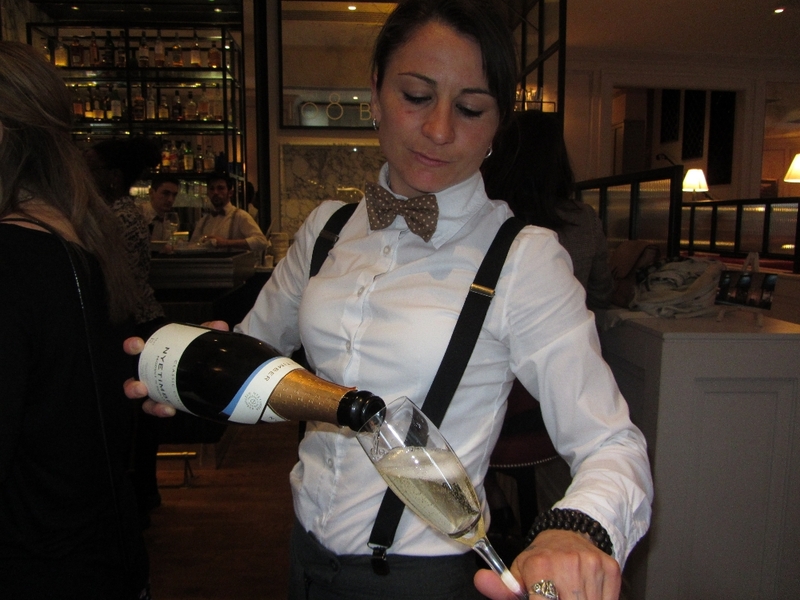 The wine pairing was the Nyetimber sparkling wine. Second on the menu was a terrine of seared Yellowfin Tuna set in East Sussex heirloom tomatoes with an avocado and wasabi sauce, again it was excellently executed, and the paired Sancerre white wine matched it very well. Third course was a real treat. Roasted line caught seabass with Isle of Orkney scallops and a shellfish sauce. Both the seabass and the scallop were perfectly cooked, and the shellfish sauce rich and deep in character. 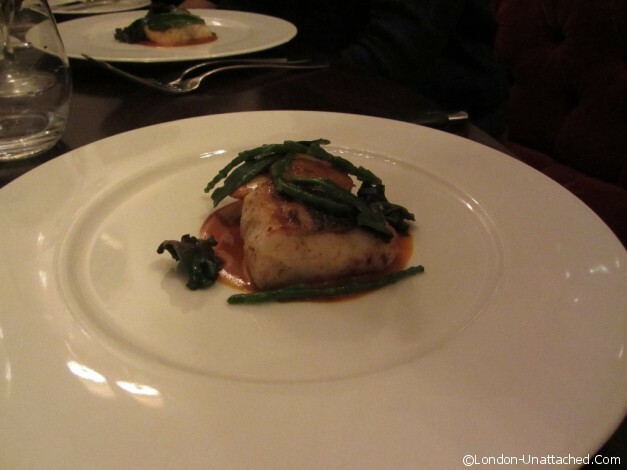 Accompanied by samphire this dish was stunning. I’m not a fan of roe on scallops usually, but in this case the roe was sweet and delicate, something I’ve not experienced before. The paired wine was an Austrian Riesling, which was a superb pairing, we could not fault any of the wine pairings, they were all great choices. Fourth course was another treat. 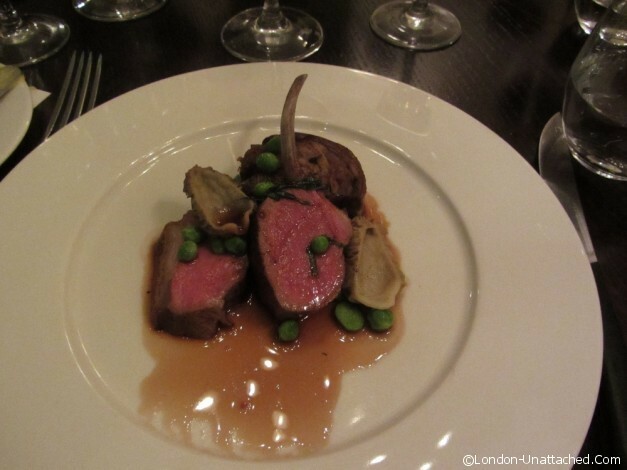 Cornish lamb three ways with morels, peas, broad beans and wild garlic. The lamb was offered pink on the rack and sirloin just as it should be, and the crispy breast meat was formed into a delicious roulade which melted in the mouth when eaten. A 2008 Barolo red wine was paired with this. Barolo is a personal favourite of mine in reds, and its depth, level of oak and complexity worked well with the lamb. The fifth course took us into dessert menu. Yorkshire rhubarb and custard! 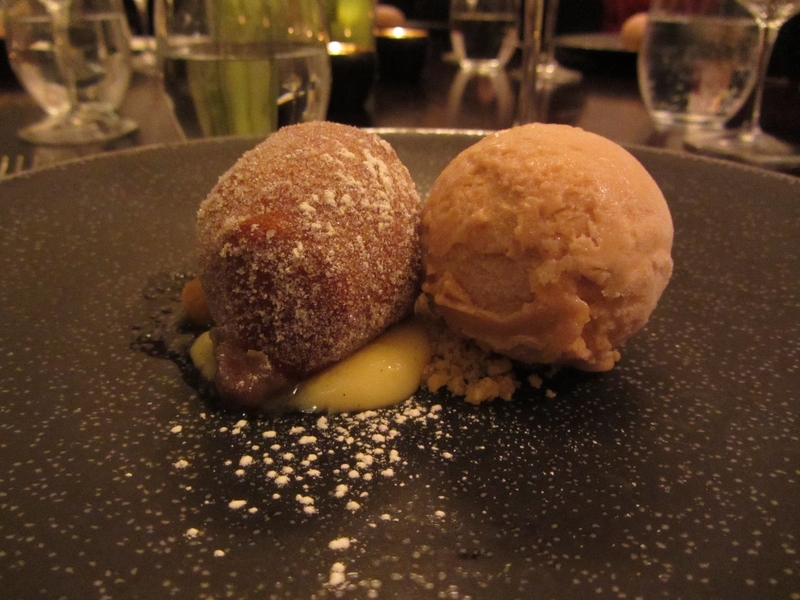 It had been taken off at a tangent and was presented as a rhubarb sorbet, accompanied by a rhubarb compote filled doughnut placed upon a custard serving. It was beautifully done, and matched with an Australian Muscat. The final course was the cheese plate. It was matched with a 12 year old Balvenie whisky, which is a master stroke really. Cheese is a strong taste in most ways and sipped whisky works very well here. All the cheeses were British excepting the Durrus from Cork, and there was a great selection ranging from goats cheese through blues to cheddar, offered with a range of biscuits. Britain makes cheese like no other country! We may suffer the multipacked bland mass market stuff that fills the supermarket shelves most of the time, but if you care to look a little deeper, there is a wealth of world-beating British cheese to be had. Well over 700 named cheeses…. far more than France produces! Needless to say this last course went down very well, and we all felt very fat and happy after it! 108 Brasserie’s ethos and their creation of the chef’s table works well, and deserves to succeed. It’s a dining experience, rather than just filling your belly. Knowing where your food comes from is an excellent enhancement to a meal. 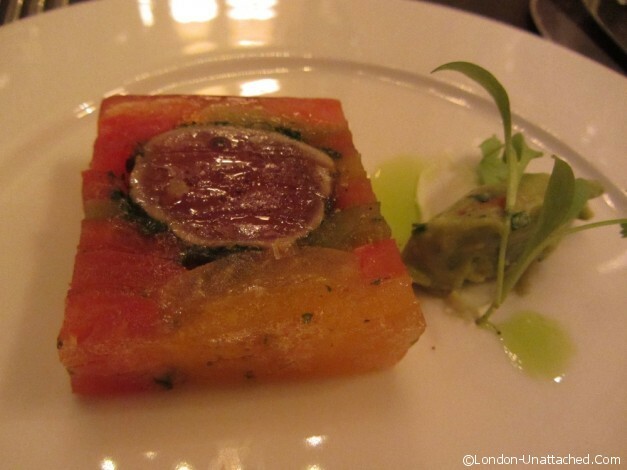 The changing menu according to season brings an authenticity to your meal. Britain’s food producers and creators have much to offer and 108 Brasserie with Chef Russell Ford’s expertise are doing a fabulous job in bringing a bit of that quality and authenticity to Marylebone. What a lovely menu! That lamb looked so tasty; the seabass+ seafood too! I loved what they did with the dessert! Yummy! 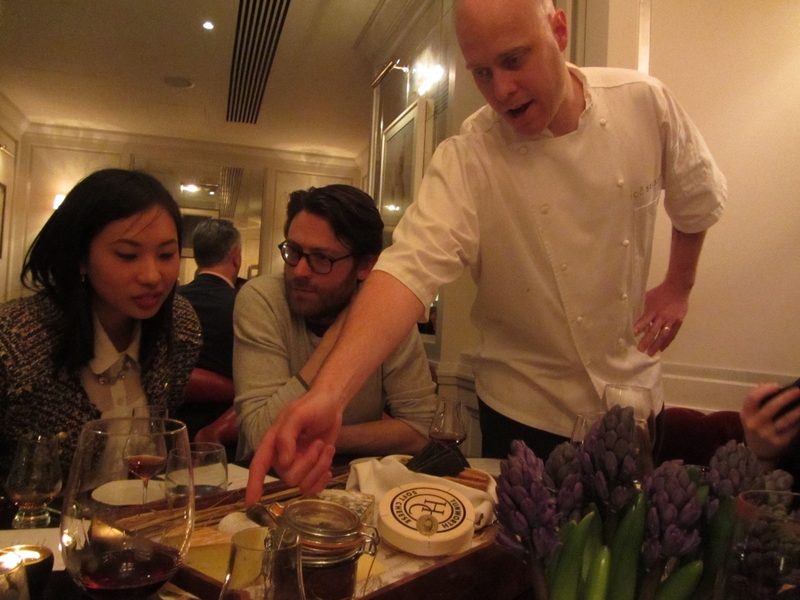 Balvenie with cheese…. that would be a tasty (and lingering ) time at the table! Stevie it was all fabulous – we didn’t get home until the small hours and the 8am meeting I was supposed to be attending didn’t happen!